April 11, 1953: My parents, Steve Brekke and Mary Hogan, are married at St. Kilian’s Roman Catholic Church, at 87th and May streets on Chicago’s South Side. There are many pictures of the day, though I don’t have immediate access to them. One I remember is my two grandmothers, Otilia Brekke and Anne Hogan, posing together. They were both widows. My dad’s father died in April 1932 (age 55, Parkinson’s disease), my mom’s in 1941 (age 53, lung cancer). They had brought up their children (my dad was an only child, my mom one of six) largely by themselves. What else did they have in common? They were both Chicago natives, both the first children born in the United States to immigrant families. Their fathers were both laboring men, their mothers both with large families (huge, by today’s standards) to see to. But there were crucial points of divergence. Mrs. Brekke was Norwegian through and through, her Sieverson clan coming from farming country south of Kristiania (now Oslo) and becoming founding members of a Lutheran parish on the near Northwest Side. Her late husband, Sjur Brekke, had been a minister in the Norwegian-American Hauge Synod. Judging from their early correspondence and what I remember of her, her entire life was bound up with the church. Mrs. Hogan was Irish through and through, her family arriving from a little island off the west coast of County Mayo. Needless to say, they were Roman Catholics, and by the time my parents met, she was well on her way to having sent all four of her surviving sons into the priesthood. In other words, my soon-to-be grandmothers were staring a mixed marriage in the face. In order for the proposed union to receive the sanction of Rome, the parties involved needed to agree to a Catholic wedding and to baptize and raise their children as Catholics. I never heard her say a word to us kids about it in later years, but I’m sure this arrangement didn’t sit well with Mrs. Brekke. So there they are, at the old Windermere Hotel on the Hyde Park lakefront, posing for their portrait together on my parents’ big day. They are smiling, but you can almost feel the chill: Grandma Brekke, who turned 69 that year, with the slightly unnatural stare that came from her glass eye, and Mrs. Hogan, three days shy of her 55th birthday, with a cordial look that’s betrayed by what my sister Ann has pointed out were her characteristically cold eyes. But by then, the wedding was done and Mary and Steve had embarked on the saga that would lead to me and my siblings and all the attendant joy, grief, celebration and misadventure. Whether my grandmothers smiled or not, life was going to go on. The Great Seal of Iowa, as rendered in a bas relief tablet by Alexander Doyle at the Iowa state capitol. In 1847, the Iowa Legislature passed a law creating a state seal. More on the wording of the law, which has caused a stir in the state Capitol in recent times, in a moment. The straightforward part of the seal is the motto: “Our liberties we prize and our rights we will maintain.” I like that: Straightforward. A little militant. No Latin. That 1847 description left a lot to artists’ imaginations and produced a series of rather passive and homely images. Search for “Great Seal of Iowa” in Google images if you’re curious about what I mean. I didn’t know any of that history when I visited the state capitol grounds in Des Moines last fall (2016). 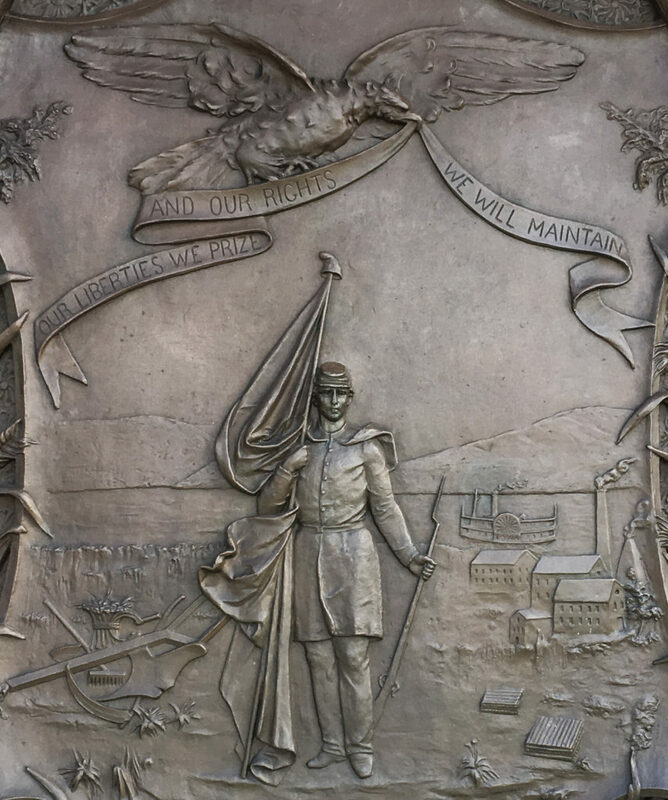 What struck me about the tablet or relief — OK, technically not a plaque — was what I take to be its direct reference to the Civil War. The soldier depicted is dressed as a Union infantryman. The musket he holds on his left side has bayonet fixed. The Stars and Stripes he supports with his right arm is partially draped around him. He is taking a step toward the viewer. His look is resolute and unafraid. “Our liberties we prize and our rights we will maintain”? The bas relief makes the statement come alive. The soldier embodies the sentiment. Is there a Civil War message here — a reference, perhaps, to how seriously the state took its duty to preserve the Union? About 75,000 Iowans — more than one in five adult men — served during the war. Some 13,000 of them died and another 8,500 were wounded and survived. Iowa’s experience largely reflected the experience of every state, North and South. In a way that’s hard to imagine today, when so few serve in our armed forces, the war touched everyone. An entry on an Iowa state government site that describes the monuments on the capitol grounds notes that the Iowa seal tablet was commissioned in the mid-1880s and completed in the early 1890s. The war was still an enduring, dominant memory for a whole generation of Americans then, just as World War II was in the 1960s — when war stories were common prime-time TV fare and a frequent Hollywood subject. The Iowa state site also mentions the name of the sculptor, Alexander Doyle, who had a national reputation by the time he got the commission for the tablet and a nearby drinking fountain featuring the cast bronze head of a bison. Doyle’s reputation rested in part on his Civil War sculptures. But he was not a Yankee nationalist. His commissions came from both the North and from the defeated Confederacy — and he was especially active in New Orleans, where he created a series of statues commemorating Southern heroes. I think if there’s a message in the Iowa Great Seal tablet, it’s that Doyle was an artist who understood the time he was depicting and the emotional expectations of his audience and knew how to translate that understanding into bronze. His was not a common talent. Note: A version of this post also appears on Read the Plaque. OK — so there’s a site I recently happened upon — ReadThePlaque.com — that appeals to my weakness for historical trivia and roadside finds. There’s a bit of a back story to Read the Plaque (you can listen to it here) that involves an object lesson in observation and curiosity about the stories that are out there in the world around us. I don’t think that plaques, which by necessity offer a shorthand (if not sanitized) version of events, are the only source of those stories. But they do open a door into the past of the spaces we move through every day and, perhaps, of how our own life and experience intersects with that history. Since I’ve made something of a habit of photographing some of the plaques I encounter — part of my visual note-taking of my daily rounds — I started submitting some of the plaques to Read the Plaque. The site invites one to “tell us about the plaque,” which I take as an invitation for added details and context to accompany the plaque text. For me, that’s an invitation to turn the submission into a mini-project. So, I’m going to take the liberty of cross-posting my Read the Plaque entries here, for posterity and my small reading public. 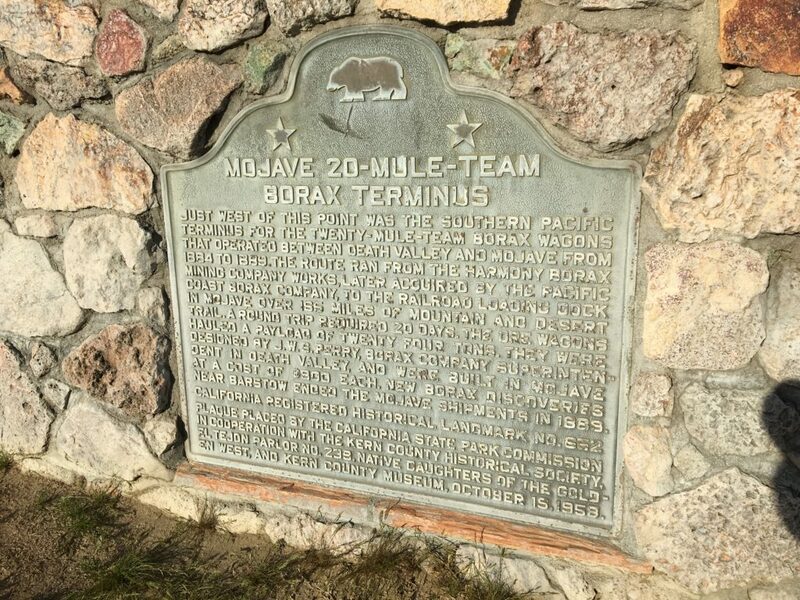 Historical marker on Highway 14 in Mojave marking long-ago terminus of borax trains from Death Valley. This is on California Highway 14, the main drag through Mojave, a desert crossroads and would-be spaceport (Burt Rutan, the designer and builder of the X-Prize-winning SpaceShipOne and Virgin Galactic’s SpaceShipTwo, has his shop at the former Marine air base on the edge of town; the facility, now run by a county agency, is styled the Mojave Air and Space Port. It’s a boneyard for old planes, too, and is a kind of fun detour if that’s the kind of thing you’re into). And now back to an earlier age of transportation: the 20-mule-team era. As to the plaque: It’s on the east side of Highway 14 — that’s the right if you’re driving north through town — between Mono and Nadeau streets. It’s placed on a scrubby lot in front of a defunct and fenced-off Kentucky Fried Chicken outlet, right between a Denny’s and the Best Western Desert Winds. As usual, though I was alerted to its presence by a sign that advised I’d see a historical marker 500 feet ahead, I drove right by it the first time without seeing it. Just west of this point was the Southern Pacific Terminus for the twenty-mule-team borax wagons that operated between Death Valley and Mojave from 1884 to 1889. The route ran from the Harmony Borax Company works, later acquired by the Pacific Coast Borax Company, to the railroad loading dock in Mojave over 165 miles of mountain and desert trail. A round trip required 20 days. The ore wagons were designed by J.W.S. Perry, borax company superintendent in Death Valley, and were built in Mojave at a cost of $900 each. New borax discoveries near Barstow ended the Mojave shipments in 1889. California Registered Historical Landmark No. 652. Plaque placed by the California State Park Commission in cooperation with the Kern County Historical Society, El Tejon Parlor No. 239, Native Daughters of the Golden West, and Kern County Museum, October 15, 1959.
c. 4:30 p.m., into the teeth of the usual P.M. freeway shitstorm. If you chose c., you and I think think differently, because I didn’t quite choose to leave at that hour, but leave at that hour I did. I checked traffic maps before rolling out, and there were long stretches of red and darker red all along the best (actually only) escape routes. No worries, I thought — I will take some side and back roads to make my way over the hills to Interstate 5. So, I took 580 east through Oakland to Castro Valley, where things were jammed up for the climb over the Dublin Grade to the Tri-Valley area. I could tell from the maps that 580 would be even worse going through Dublin and Livermore and on over Altamont Pass, so I thought I’d use an old cycling route over Palomares Road to Highway 84, which goes through Livermore from Fremont. Palomares was great, once I found it. Not fast, because it’s a real back road that winds and twists constantly as it climbs the hills and then descends to Highway 84. 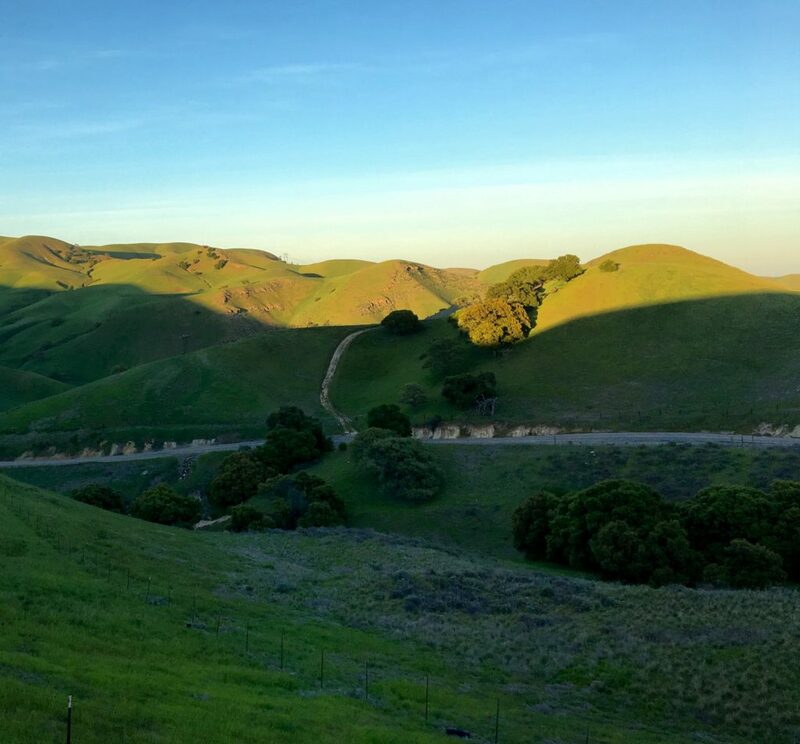 Highway 84 was a brilliant idea, though it was bumper to bumper for a long, long way into and through the townlet of Sunol. After that it opened up, and I had just normal non-freeway traffic through Livermore — time now 6:30, or two hours into the trip — and onto Tesla Road and up the last set of Coast Range hills into the Central Valley. Tesla Road, at the point it crosses the divide between the Livermore Valley and the San Joaquin Valley. Lots of people use this as an alternate route to the miserable slog on 580 over Altamont, but everyone moved at a spritely pace up the steep, winding road over the top and down into San Joaquin County. In fact, some drivers crossed the line between spriteliness and recklessness. I saw a couple of cars cross the double-yellow line to pass a slower moving vehicle on a nearly blind downhill curve. Well, no one was killed. This time. Corral Hollow Road, as it’s called on the San Joaquin County end of the road, hooks up with Interstate 580 at a point where it has diverged from I-205 and is usually just screaming along. The speed limit is 70 mph, and if I’m going 75 I feel like kind of a slow poke. But more of that in a minute. I probably hit 580, which joins Interstate 5 about 10 miles further south, at about 7:20 p.m. It was dusk, and it didn’t make sense to shift over to whatever scenic routes I might devise. The bucolic portion of the drive was over. If I have myself time — something I never do — I probably would stay off I-5 as much as possible. The side roads going down the San Joaquin Valley are many and, at this time of year, and especially after all the rain this year, beautiful. The countryside is green and welcoming in a way you can hardly imagine if you only see the place in the brown haze of summer or the gray of winter. 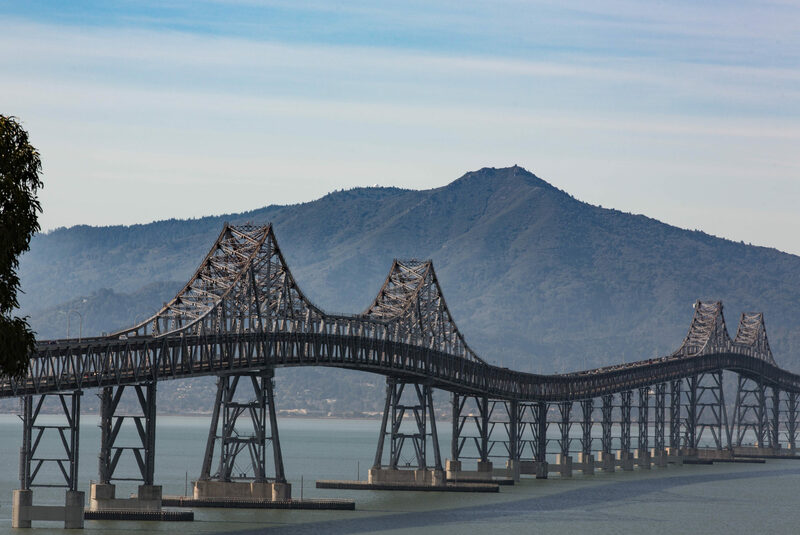 The other reason one might stay off of I-5 between the Bay Area and L.A. is that it’s one of the most stressful driving experiences you can find. Speed is part of it. If you’re driving 80 — yes, I know, that’s over the posted speed limit, but still quite common — you really have to be on top of your game. But it’s not really the sheer speed that gets to you. It’s the varied speeds on the two lanes from the Tracy area down to the bottom of the Grapevine. I-5 is the major truck route between Northern and Southern California. Trucks have a dramatically lower speed limit — 55 mph, and they seem to stick close to it. That means you have a mix of high-speed four-wheelers mixed in with some very slow moving 18-wheelers. But that’s only the beginning of the issue. Many of my fellow motorists are driving at 70 or so — some just above, some just below. That’s fine. They may live longer, happier lives than the likes of me. But here’s the thing: They aren’t content to drive their rational 70 mph in the right lane of the two lanes available. No. They would much, much rather cruise at their comfortable, non-threatening pace in the left lane. Yes, it’s true that there will be slower traffic they need to pass. For instance, the trucks I just mentioned. And then they will need to use the left lane. But the notion of completing the pass in some sort of expedited fashion — taking note of traffic approaching from behind, for instance; not getting into the passing lane before you need to; maybe speeding up a little to complete a pass (a technique I was taught in driver’s ed); and then moving over again (another driver’s ed lesson) — is not one that is widely shared based on the behavior one sees on the highway. The net effect last night was that whenever the river of left-lane traffic encountered an obstacle — a truck or series of trucks in the right lane, say — the left lane would bunch up and slow down, with lots of nonsensical tapping of the brakes as the flow of traffic went from 75 mph, say, down to 60 or 65. It was kind of like NASCAR in super-slow motion. –If you see any traffic ahead in the right lane — even that little speck out there in the horizon — you’ll be catching up in five or 10 minutes. Better get over to pass. –Life is easier in the left lane. You don’t have to worry about getting over to pass. And why is that guy on my bumper? –Drive with your brights on — all the time. It helps you see the gestures the driver in front of you is making. –If the slower jerks in the left lane won’t move over, accelerate — accelerate with extreme prejudice — and pass them on the right. And do it over and over and over again. And in conclusion let me say: No — I am not on a crusade to change the way the rest of the world behaves, there are serious flaws in the way I do things on the road — speeding, right-hand passes — and I don’t give enough credit to all the people I see who do behave in a rational, courteous way. To complete the trip narrative, though: I got to L.A. in one piece, arriving at our downtown hotel at midnight after following the Apple Maps directions — which at one point involved exiting northbound 110 at Dodger Stadium and doing a U-turn back onto the southbound ramp — and getting lost briefly on surface streets. Anyway. Here I am. Today’s travel will be on public transit.